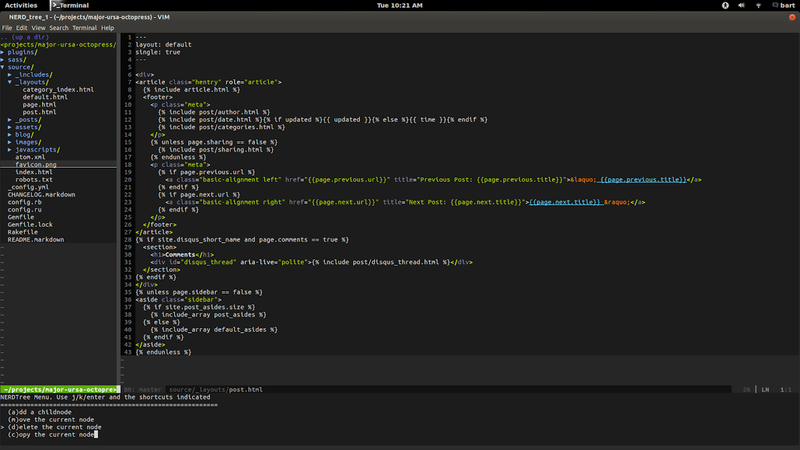 I thought I’d write up a couple quick posts on vim commands that I have been using lately. This first post is on NERDTree. Wow, this plugin is so amazing. It is a sideloaded file browser for vim. My leader key is comma, so once the previous code is added to my .vimrc, I can type ,nt in normal mode, and NERDTree’s file browser pops open on the side and displays the current working directory. Type C-w h (Control-w h) to send focus to the file browser and hit <enter> over a directory to expand it, or press <enter> over a file name to open it in the main window. Next to close the file browser type ,nt again and it disappears. Use NERDTree to rename and create new files. type in it’s new name, press <enter> and the file is renamed. press m while on a directory. arrow down to the new file name and select it to start editing it. press m to bring up the menu. press d to delete the file. By default NERDTree opens a file you select in the current window (the last window you hopped to the file browser from.) If you’d like to open it in a new horizontally split window, press i when cursor is on the file. To open it in a new vertical spit, type s.
As mentioned earlier, you can type ? while in the file browser to bring up a help window. Type ? again to toggle the help window’s display.